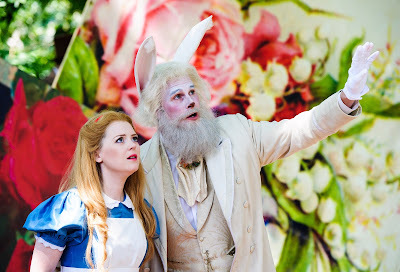 Returning for a third (and now almost sold out) season Opera Holland Park’s take on Alice’s Adventures in Wonderland is a 70 minute jaunt through a classic tale that has been re-worked into an enchanting opera. Will Todd and Maggie Gottlieb have taken the best of Lewis Carroll’s story and distilled it into words and music that include some delicious nods to blues and soul, as well as the most ingenious of stagings. Ushered in through a gap in the woods, (so kids’ vivid imaginations are fired up right from the start!) the audience are invited to promenade around Holland Park’s Yucca Lawn as the opera’s different scenes are played out on 4 separate performance spaces set amongst the Lawn’s trees. Leslie Travers’ designs are simple yet vivid - the Mad Hatter’s sloping tea-table is a work of genius as is the singing “drink me” bottle, with Maud Millar giving life to an entertaining aria. Fflur Wyn is Alice and she captures the attention of her enthralled crowd. Never once patronising, her Alice defines curiosity and decency in a way that children will easily recognise. Other gems in a cast that is excellent throughout include James Cleverton’s Rabbit and Robert Burt’s suitably worn down modern-day dad, doubling up later as the Red Queen, axe ever at the ready. Keel Watson’s lugubrious baritone offers up a shisha smoking caterpillar whose big number is the Wonderland Blues, but be warned: the show is un mic’d and whilst it is a credit to the performers’ classical training that so much of the vocal performance is clear, there is a drawback. Sit too near the orchestra (who also promenade from set to set along with the audience) and you may find the music drowning out the words. 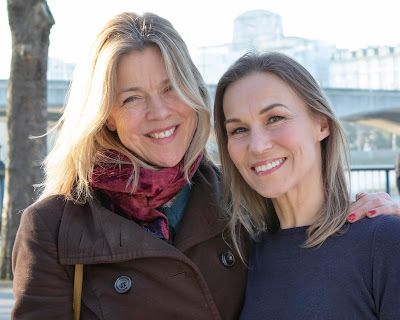 I (along with my guests, 4 year old Layla and her father) missed all of Watson’s blues work and there were moments elsewhere of voices not being heard over the orchestra – so as you wander, think carefully about where you position your cushion. Matthew Waldren conducts his roving 11 piece orchestra perfectly and even if at times the lyrics become inaudible, Todd’s melodies and the on-stage action, more than hold one’s attention. Whilst Layla wasn’t bored (just), much of Gottlieb’s caustic wit passed her by and the show will be best enjoyed by children aged 6-7 upwards. That being said, in an era saturated with CGI’d Disney animation and streamed electronic stimulation, for kids to be given a glimpse of opera, set amongst the trees and with performers and musicians weaving around and amongst them, can only make for a wondrous show. Opera Holland Park’s Alice's Adventures in Wonderland is a classy summer treat.